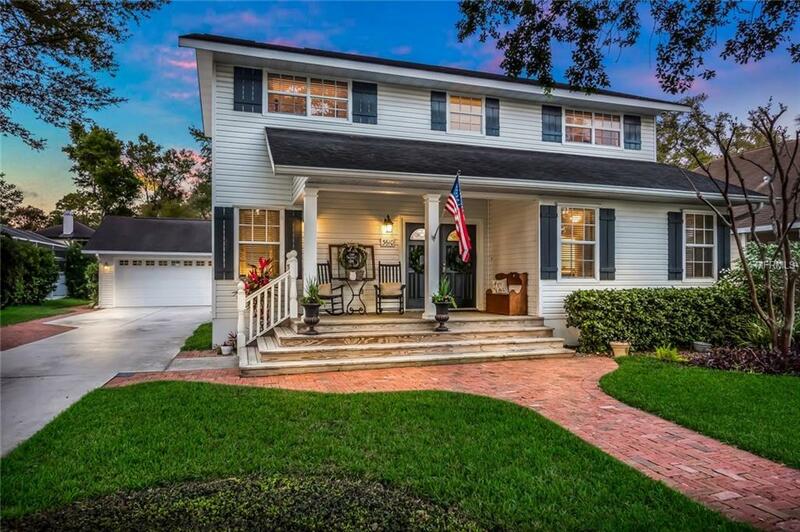 Nestled only a few blocks from the Manatee River sits this charming 4 bed, 2.5 bath, 2 story Old Florida Contemporary style home. A large extended driveway leads you to the brick paver walkway surrounded by meticulous landscaping and wrap around steps to a picturesque front porch made for enjoying your morning cup of coffee. Double doors open to the entryway where you will instantly notice the gleaming hardwood floors throughout that lead you to the impeccable living room accentuated by vaulted ceilings, and a chic marble fireplace nestled into the corner. The graceful flow brings you into the bright dining area that is separated by contemporary pillars. Continue to the chefs kitchen that offers stainless steel appliances, custom cabinetry, and a breakfast bar. Set just beside the kitchen lies a uniquely custom-built in table overlooking the lanai. A first floor master bedroom is immersed in natural light featuring an immaculate upgraded en-suite master bath with double sinks and shower. At the nights end, make your way out to the lanai and enjoy peaceful simplicity while overlooking your gorgeous shimmering pool surrounded by upgraded travertine tile, and lush landscaping to complete the setting. The fenced in backyard includes a custom-built tree house. This home features plantation shutters throughout, a 2-car garage and a large laundry room with storage and utility sink. Conveniently located close to AMI beaches, Downtown Bradenton Riverwalk, and Saint Stephens.